As discussed in parts one and two, the actual hardware needed to run Blender must be OpenGL 3.3 compliant. So what does this actually mean in practice, especially for laptop/notebook users and those with small form factor desktops. Typically, and most easily, a graphics upgrade is going to be in the form of a PCI(-e) slot-in graphics card, full, half or proprietary length, full, half, low profile or height, something similar to the following. Obviously the aforementioned systems can’t use them… or can they. The items shown below are for illustrative purpose only, not product endorsements. Any links provided are for convenience. A typical example of a discrete graphics card that’s easy to upgrade failing systems with, an nVidia based MSI GTX 1060 (or similar from AMD) [image courtesy NewEgg]. At face value laptop/notebook and Small Form Factor (SFF) desktop computers cannot utilise standard graphics cards. However, it is possible through use of an external graphics enclosure like the below, which typically connects using Thunderbolt, USB or other high-speed connection type. They are essentially self contained cases that include a suitable PSU, or room for one to be added, and one or more PCIe slots to accommodate cards of different length, height or number. Price naturally varies from a few hundred to thousands depending on the set up. An example of an external, dedicated and self-power enclosure (case) that can hold a discrete graphics card then able to run Blender 2.8 compatible graphics [image courtesy PowerColor]. Alternatively bare-bones external PCIe graphics adapters, often referred to as a ‘beast dock‘, can be used. Similar to the below they require an available Express card slot (PCMCIA), USB, open and accessible PCI, mSATA or mPCIe socket, depending on the connection option chosen or available, and an additional external power source, either a dedicated 12v laptop style power brick or desktop PSU. Price ranges from low to mid hundreds depending on the set up. Whilst an external adapter may seem the cheaper route they also fraught with more reliability and usability issues, from firmware and driver support to the insecure nature of the device, the physical security of the card depending largely on it’s weight to hold it in place, making it prone to pop-out failures. An example of an external, dedicated adapter that holds a graphics card [image courtesy eBay]. Mobile workstations or Small Factor Format desktops that include an MXM slot, essentially an internal small format PCI socket aligned so cards rest horizontally instead of vertically, can make use of MXM graphics modules, graphic cards or boards powered and routed internally to display output via sockets embedded on the motherboard, not the card. These are less readily available and cards are not a uniform size, often manufactured to accommodate specific motherboard or the internal layouts of specific laptops. They also do not include cooling, as again this is often designed to fit a particular system and MXM card requiring a custom heat-sink and/or cooling device be made. If the laptop/notebook or small desktop did not originally include an MXM card this may mean a larger power brick will be needed otherwise screens will appear black or systems will refuse to boot. Manufacturer support may also be an issue, especially for boards shipped from directly China rather than a brand owner (nVidia, Sapphire et al). An example of an internal MXM card mounted inside a small desktop with a custom manufactured heatsink. When trying to find hardware that will allow Blender 2.8 to run on a system that’s not easily upgradable, what will not work are devices like the below, USB powered/connected extenders. Often mislabeled or erroneously marketed as external graphics adapters, external video adapters or external display adapters are design to supplement the basic functionality of a computer systems native graphics capabilities by extending the display of a desktop onto additional screens, they don’t have any inherent graphics ability as might be expected in this context. So whilst useful, they are little more than an A-B connector (e.g. USB in, HDMI out) with signal converter. An example of an external ‘extender’ designed to display an original source, a desktop, onto one or more additional monitors or screens – these have no effect on Blender 2.8 being able to run as they reply on native graphics capabilities [image courtesy StarTech]. 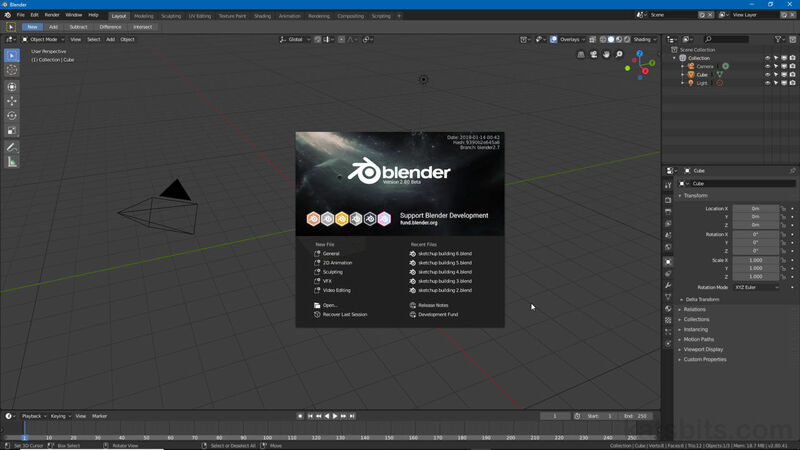 Using or upgrading a laptop or small form factor computer for Blender 2.8 is not inherently an issue as a number of viable options are available as discussed above. Each does however incur varying degrees of ‘cost’; drivers, compatibility, reliability; and investment, from a few dollars to a few hundred or thousand, at which point replacing the device may be more prudent (used hardware offers a cost effective option when going down this road). Before deciding on an solution however, always research what’s available per individual circumstance, especially for lower cost devices shipped from China, as they are often sold without support of any kind besides generic you-pay-return-postage manufacturers warranties – check firmware availability, drivers and system BIOS compatibility; slots and ports may be available but systems may deny their being used for beyond the intended purpose without an update of some kind. Most, if not all, the hardware shown above can be purchased from the manufacturers websites (graphics cards and graphics card enclosures), or from Amazon, eBay, Facebook Marketplace etc.